Hi everyone – the weather for Friday looks good, so we should be able to get some cricket in!! Please come back to our club rooms after the completion of matches, training and Milo, as we have some team announcements, which will be great to hear – whilst having some Piccolino Pasta, sausages and a cold drink!! A few updates again this week!! Please ensure you support our sponsors – even if you are looking for a quote, please keep our sponsors in mind. Please also mention to them you are from Nunawading CC. Our famous Curry Night will be held on Friday 25 November (after the completion of matches, training and Milo). For those families new to the club, this is a night where families can cook and donate a curry or rice dish to the club for our post match presentations in the club rooms. Those families who provide a curry, can then simply try everyone’s cooking and enjoy a night together. For those families who are unable to cook a curry, we simply ask for $5 per plate to also share in what is a great night. We always ensure we have sausages for those children who may not like a curry!! 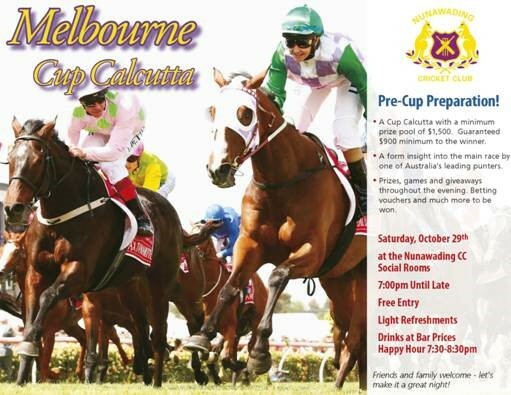 All parents are invited to come along to our club rooms this Saturday night for the Nunawading CC 2016 Melbourne Cup Calcutta. Please feel free to bring along other friends who are not part of the club. Invite attached!! Once again, our club will be participating in the Toyota Good For Cricket Raffle. This will be our main fundraiser for the year. It is a raffle which is supported by Cricket Australia, and where all the money raised comes back to Nunawading CC!! There are also some great prizes. We will start distributing books this week, and hope that families will be able to buy/sell some tickets!! This week I would like to acknowledge Magda Jackson as our #beinvolved member of the week. Magda and her family have been at Nuna for a few years in Milo and U10 last season. This season, Magda has put up her hand to be Team Manager of the U10 Gold Team. In doing this, not only has Magda hit the ground running and is doing an awesome job as Team Manager, Magda was also helping out last Friday night preparing food for those who came back to the club (whilst Jean-Paul Lefebure and Scott Millar were doing some handy man jobs in our club rooms – thanks gents). What Magda has brought to the club this season, is exactly what makes the club successful. Thanks Magda! !